Olympus has introduced the new Diffusion Measurement module for Olympus ASW 2.1 software. Designed specifically for use with the Olympus FluoView FV1000 confocal microscope system for live cell imaging, this new software module provides users with the flexibility to undertake three different types of diffusion study: point fluorescence correlation spectroscopy; raster scan image correlation spectroscopy (RICS) and fluorescence recovery after photobleaching (FRAP). As a result, the Diffusion Measurement Package is suitable for a broad range of cell biology and biophysics applications. Data is obtained from a single location using point scanning, enabling fluctuations in fluorescence intensity to be recorded. The number of moving particles within the confocal volume is therefore easily calculated. With its high temporal and spatial resolution, this technique provides data on the diffusion constant or number of molecules, as well as the capability to analyse cross correlations between different molecules. 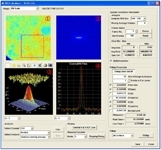 With the ability to provide diffusion measurements in various cellular regions, the software is able to present the user with a spatial mapping of diffusion time constants. As a result, users can easily define small regions of interest and subsequently create a diffusion map from a series of 2D images. A wide range of intracellular structures, from molecules in solution to cell membrane proteins, can therefore be accurately measured. Resulting data can be expressed as either a diffusion constant or the number of available molecules. As a widely used fluorescence analysis technique, researchers commonly use FRAP to analyse the diffusion constant in a particular region of the cell, as molecules diffuse into the area after photobleaching. The Diffusion Measurement Package enables users of the Olympus FluoView FV1000 to control and measure the diffusion constant with ease.